Enjoy the sweet mild flavor of cooked cabbage or spice it up with your favorite seasoning! In a large skillet heat margarine until foamy. Add cabbage and carrots. Sauté over high heat until tender but crisp, about 4-6 minutes. Add salt and pepper and serve warm. 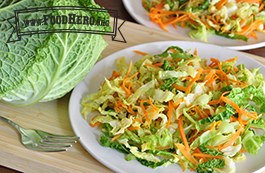 1 Comments for "Sautéed Cabbage"
This is my go-to veggie side dish! I use chopped carrots instead of shredded and just cook them in the pan for a couple minutes before adding the cabbage.